The Japanese consumer electronics giant, Panasonic has announced the availability of its two new HD camcorders – Panasonic HDC-SD10 and HDC-TM10, which the company claim as the world’s lightest full HD compact camcorders, which weigh less than 230g, featuring capability of recording full HD (1920 x 1080 pixels resolution) video footage, powerful 16x optical zoom, Advanced O.I.S. (Optical Image Stabiliser), touch-screen control and iA (Intelligent Auto) function with AF/AE Tracking that automatically tracks a moving subject for optimal result. The Panasonic SD10 and TM10 HD camcorders differ only by their recording format, with SD10 records to SD/SDHC memory card (up to 32GB), while the TM10 offers 8GB integrated memory as well as SD/SDHC memory card recording aimed for ultimate convenience. According to the company, the Panasonic SD10 and TM10 camcorders can cleverly record 3 seconds of images into an internal buffer memory (before REC button is actually pressed), aiming to help users not so easy to miss capturing a critical moment, thanks to its Pre-Rec function. 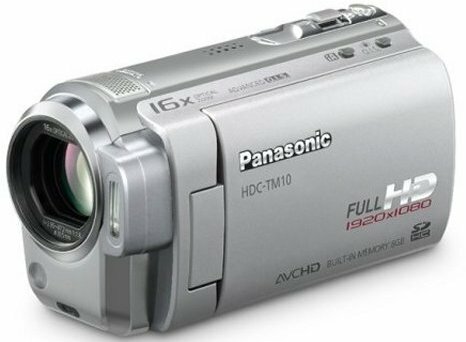 The new Panasonic HDC-SD10 and HDC-TM10 full HD compact camcorders that compatible with VIERA Image Viewer function will be available in coming June for £499.99 (($775) and £529.99 ($820), respectively.